Lead a church sports and recreation ministry? Direct a Christian school athletics program? Manage a faith-based youth league? Have you tried a sports devotional curriculum? When it comes to building and strengthening faith in young people through sports, we all want to teach valuable, Christ-centered life lessons that cultivate kids’ love for Jesus. Our common goal is to be intentional about building the faith of our players, coaches, and parents and lead them to a lasting relationship with our Lord and Savior. How does a sports devotional curriculum help? Your to-do list is long. The next sports season is right around the corner. There are tons of things you need to get done to be prepared. Your time is taken up organizing rosters, recruiting and training coaches, communicating with parents, ordering equipment and uniforms, planning fundraisers, cultivating sponsors, and scheduling practice fields, just to name a few. You understand that devotional time with the players is a critical part of fulfilling your mission. But often the tyranny of the urgent gets in the way. When the day is done, you probably haven’t had time to get around to writing devotionals. Finding quality devotions and putting them in the hands of your coaches is a huge relief. If you did have the time to write your own devotions, would you make them sports-specific? Would the devotions you hand your baseball coach have to do with baseball? And the devotions you hand your soccer coach have to do with soccer? Or, would you save time by creating a generic version for all the different sports in your organization? Would you also take time to write an age appropriate version that engages younger kids and a more challenging version for older athletes? A sports devotional curriculum covers all these bases for you. 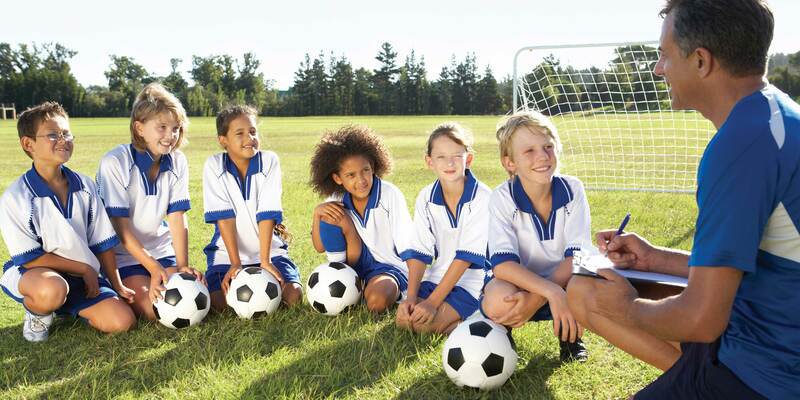 It’s specific to the sport kids are playing so that the types of situations players find themselves in during practices and games are discussed under the light of God’s truth. Kids make the connection between sports, their own life experience, and what God has to say in his Word. They begin to think about how they can demonstrate their own faith in real ways. Have you ever tried to fill the gap with a book of sports devotions for kids? These books cover a large variety of sports. Perhaps you could pull out all the ones that relate to your chosen sport, but they still fall short of delivering a consistent message. You will likely end up with a random collection of topics that jump around the Bible. Whereas a sports devotional curriculum focuses on a theme or book of the Bible that points to Jesus and the Gospel message. Kids can see the big picture of their Heavenly Father’s goodness and saving grace through Jesus Christ. All of this within the context of the sport they love to play. Perhaps you don’t write your own devotionals or pull from books. Instead, your coaches are in charge of coming up with their own devotions each week. Some coaches enjoy the challenge. Others panic at the thought. They signed up to coach, but may not feel comfortable being tasked with leading a Sunday school style lesson. They may even skip that part altogether. Don’t allow devotional time to be the weak point in your youth sports organization. Make it your strong point. When you give your coaches a sports devotional curriculum, you give them confidence. Equip and empower them to lead simple yet spiritually rich 15 minute devotionals every week. Offer to make their life easier by taking off this stress. You never know, it might even help you retain more coaches for next year. Do you have kids who play year after year? Do you want to help them continue to grow in their relationship with their Heavenly Father? In that case, you probably don’t want to repeat the same material the very next season. A sports devotional curriculum helps players explore more of the Bible and grow in their knowledge and understanding of God’s timeless truths. Can you recycle them after a few years? Of course. Until then, you can count on us to develop new fresh series year after year with one consistent theme, for one dedicated sport, carrying through one full season. What are you looking for in a sports devotional curriculum? Send me special offers and announcements for the next sports season! © 2017-2018 Team Sports Devotions | All Rights Reserved.